Can your e-commerce search solution think and understand like a human? If so, your site turns into virtual sales associate, understanding clearly what customers want and closing the sale. Internet Retailer has published an article, Reading Shoppers Minds, which explores how e-commerce search solutions have become more human-like for e-retail and mobile commerce. The article highlights how EasyAsk customer The North Face makes their site more human like to help their shoppers. Natural language is an integral part of making your e-commerce site smarter and more human like. Natural language makes your search box more versatile, expanding the vocabulary your site understands and allowing customers to express what they are looking for in their own words. Natural language is important in everyday e-commerce, and is IMPERATIVE in mobile commerce. In a mobile environment, your customers will use voice to input their searches, expressing their searches, as one industry analyst put it, “using a free flowing stream of consciousness”, such as: I’m looking for a Michael Kors watch in rose gold and I don’t want to pay more than $300. Can your e-commerce search find that? Q3 2014 statistics from the Monetate Ecommerce Quarterly show that customer conversion rates on mobile devices were only 0.80%, much lower than the 2.78% customer conversion rate for on traditional desktop PCs. EasyAsk Voice Shopper creates a new paradigm for mobile shopping by allowing customers to have a conversation with a mobile commerce site or app, just like speaking with a sales associate. National Retail Federation, The Big Show, New York, NY, USA – January 12, 2015 –EasyAsk (www.easyask.com), the leading provider of e-commerce search solutions for e-retail, mobile commerce and B2B commerce, today announced EasyAsk Voice Shopper, an intuitive, conversational voice search solution for mobile commerce sites and native apps. EasyAsk Voice Shopper enables customers to interact with a mobile commerce site or app using their voice to find the right products quickly and easily for fast, easy customer conversion. According to Forrester Research, mobile commerce will surpass $293 billion in sales by 2018, comprising 54% of the total U.S. e-commerce, and surpassing desktop web commerce sales. Yet, the Monetate Ecommerce Quarterly from Q3 2014 showed that customer conversion rates on mobile devices were only 0.80%, much lower than the 2.78% customer conversion rate for on traditional desktop PCs. The limited screen real estate and clumsy thumbpads make it hard for shoppers to interact with mobile commerce sites or apps to find the products they want, hindering customer conversion. EasyAsk Voice Shopper creates a new paradigm for mobile shopping by allowing customers to have a conversation with a mobile commerce site or app, just like speaking with a sales associate. Having evolved from over 15 years of natural language research and development, the EasyAsk conversational search engine powers the conversation with the customer, combining an understanding of the shopper’s intent with the deep knowledge of retailer’s products and merchandising objectives to deliver the right products. The EasyAsk Voice Shopper allows customers to ask for products or services using any style – explicit names, categories or sub-categories, virtual categories or product concepts, long-tail searches, and full sentences. The request can have terms or attributes in any order, allowing the customer to freely speak their search in their own words. Customized, conversational responses for interactive feedback to the customer and the ability to offer additional product or search options. A video demonstration of EasyAsk Voice Shopper can be viewed at https://www.easyask.com/products/mobile/. EasyAsk Voice Shopper is part of the EasyAsk E-Commerce Search and Merchandising product family, which delivers a harmonious omni-channel (mobile, web, and in-store) customer experience which is optimized for different devices (mobile, tablet and desktop). Voice has now become the interaction method of choice on mobile devices. Major mobile and e-commerce leaders such as Apple, Google, Microsoft and Amazon are making voice the centerpiece of the mobile user experience. According to the October, 2014 Google Mobile Voice Study, 85% of adults and 89% of teens now believe voice search to be the future for mobile. EasyAsk Voice Shopper works on both tablets and mobile smartphones. It supports mobile commerce sites on any mobile device, and mobile commerce apps on iOS and Android devices. EasyAsk Voice Shopper works with built in voice translation services on mobile devices. Existing EasyAsk customers can extend their existing search services to use the Voice Shopper with no additional effort. Leading e-retailers such as True Value Hardware, The North Face, JJill, Lamps Plus, Anna’s Linens, Boscov’s, Travers Tool, Journey’s and AlphaBroder have mobile optimized m-commerce sites powered by EasyAsk that support voice search today. EasyAsk is the leading provider of e-commerce site search, navigation and merchandising solutions for e-retail, mobile commerce and B2B commerce. EasyAsk products go far beyond traditional site search, allowing customers to ask for products like interacting with a sales associate and getting exactly what they want. EasyAsk Voice Shopper enables e-retailers to support voice shopping, allowing visitors to converse with a mobile commerce site or app by speaking to their mobile device. Customers that use the EasyAsk software see a tremendous boost in online revenue through increased conversion rates, improved customer experience and agile merchandising. Based in Burlington, Massachusetts, with offices in Europe, the EasyAsk solutions are used by leading e-retailers and e-commerce sites such as The North Face, Anna’s Linens, Journey’s, Aramark, JJill, True Value, Andertons Music and Sonic Sense. For further information please visit www.easyask.com. Outdoor gear and apparel retailer The North Face continues to see strong results from its use of natural language and voice-enabled search, helping its sites across mobile and desktop in several European counties to deliver a 35 percent increase in search conversion rate and 24 percent increase in revenue from search. As mobile use continues to grow, consumers are increasingly looking for streamlined on-site search experiences from their smartphone, which natural language and voice capabilities can provide. The North Face introduced the enhanced search capabilities on its sites in the United States and Canada in late 2012 and to the European sites in the summer of 2013. Click here to read the rest of the article in the Mobile Commerce Daily. 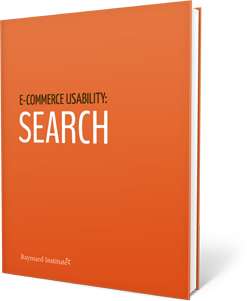 the EasyAsk white paper, Improving E-Commerce Search to Meet the Needs of the Modern Shopper. To receive your free copy of these informative reports, please click the download button below. This article in Mobile Commerce Daily examines the new release of Amazon’s iPhone mobile app, and its new feature: Voice Search. In the article, EasyAsk’s John Morrell comments on the user experience with the Amazon Voice Search. Amazon released a new version of its’ iPhone app (version 4.3.0) that contained a very interesting new feature – Search with your Voice. 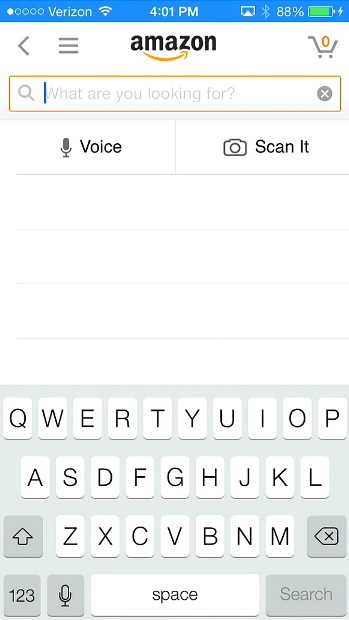 When you open up the app and tap the search box, you can then tap the Voice button and enter your search by voice. Very nicely done! But some are questioning the true capability of Amazon’s voice search, as reported in this article in the mobile commerce daily. The real question is: what’s behind that search? In the end, voice search is only as good as the search engine behind it. I tried two searches with the Amazon app to see how good it was. The batteries in my wireless home phone set had recently gone out (the phone is old) and I am looking for a new home phone. My current Panasonic model had served me well, so I was looking for a new Panasonic model. So, for my first search, I tried “Panasonic wireless home phone.” The voice interface translated my voice request well. But the results left me somewhat confused. I received 5,391 results! The first 3 were Panasonic phones, but then there were headsets and AT&T home phones mixed in. The results were not highly relevant. Then I decided to try a conversational style search – “I’m looking for a Panasonic wireless home phone.” The results were not even close to being relevant. They included a USB charger, iPhone cases, and headsets, finally followed by a couple Panasonic phones. The ability to interact conversationally with the mobile phone user is a core design philosophy of a good voice interface, as depicted by this Information Week article. Without relevant results and conversational interaction, users will not fully trust the interface or find it engaging. Any EasyAsk customer has voice search capability built-in. But EasyAsk takes it to the next level with highly precise and accurate results, and the ability to have conversational search, as shown by this video. With mobile commerce conversion rates lower than those of a standard e-commerce site, it is the engaging voice search capability powered by conversational search that will increase your m-commerce conversion rates. Burlington, MA – October 14, 2014 – With Halloween fast approaching, the number of shoppers on the Oya Costumes e-commerce sites grows daily, reaching peaks for the year. Up to 70% of the annual online revenue for Oya Costumes lies in the balance during the critical Halloween season, making customer conversion incredibly important. Oya Costumes uses EasyAsk, the leading provider of e-commerce site search, navigation and merchandising solutions for e-retail, mobile commerce and B2B commerce. EasyAsk products offer engaging conversational search which has unprecedented accuracy and precision, putting the right products on the first page every time. EasyAsk voice mobile search gives freedom of speech to shoppers on mobile commerce sites, allowing them to search by speaking to their mobile device. Oya Costumes is Canada’s finest internet costume business selling fun, costumes, hats, makeup, decor, masks, shoes and lots more. The company has sold products online for 10 years and operates 3 different sites powered by EasyAsk – a U.S. English site, a Canadian English site, and a French Canadian site. The Oya Costumes sites run on the NetSuite Ecommerce platform. Oya Costumers offers over 6,000 products on its’ e-commerce sites. In 2014 Oya Costumes added over 1,500 new costume designs, many licensed from new licensors over a large number of new themes and characters. This created a big challenge for the online merchandising team. Shoppers needed to find products in many different ways – by character, theme, licensee, category, size, color and more. A recent e-commerce search usability benchmark study by the Baymard Institute  showed that 54% of the top 50 U.S. e-commerce sites did not support “thematic searches” (searches around themes or concepts) and 50% did not support “relational searches” (searches using terms that are related to the items). With EasyAsk, Oya Costumes offers search with the utmost flexibility, supporting searches using themes (“1970s women’s disco costume”) and terms related to items such as various characters (“Princess Elsa from Frozen costume”). EasyAsk’s ability to support more sophisticated search terms and ease in adding search synonyms played an important role in Oya Costumes getting the new and existing products onto their site and giving shoppers an easy search experience and richer site navigation. EasyAsk’s integration with NetSuite Ecommerce made the EasyAsk rollout swift and immediately adds new search capabilities as additional products are added to the Oya Costumes NetSuite catalog. Oya Costumes sites are in two different languages – English and French – and support two different currencies – U.S. dollars and Canadian dollars. EasyAsk’s internationalization support and its’ multi-currency capability played a strong role in Oya Costumes selecting EasyAsk for their e-commerce sites. EasyAsk is the leading provider of e-commerce site search, navigation and merchandising solutions for e-retail, mobile commerce and B2B commerce. EasyAsk products go far beyond traditional site search, delivering unprecedented accuracy and precision to deliver the right products on the first page every time. EasyAsk voice mobile search gives freedom of speech to shoppers on mobile commerce sites, allowing them to search by speaking to their mobile device. Customers that use the EasyAsk software see a tremendous boost in online revenue through increased conversion rates, improved customer experience and agile merchandising. Based in Burlington, Massachusetts, with offices in Europe, the EasyAsk solutions are used by leading e-retailers and e-commerce sites such as The North Face, Samsonite, Anna’s Linens, Journey’s, Aramark, JJill, True Value, Andertons Music and Sonic Sense. According to Goldman Sachs, global mobile commerce sales will reach $626 billion by 2018, growing nearly 5 fold from 2013. The $626 billion in global mobile commerce sales in 2018 will be just shy of the total global e-commerce sales for 2018 of $638 billion. However, customer conversion rates on mobile smartphones are alarmingly low. The average conversion rate on a traditional desktop is slighly over 3%. The conversion rate on mobile smartphones is less than a third of that rate – around 1%. Many e-commerce firms have launched mobile sites that are well designed for the display aspects of the device – they fit the size and some of the look and feel requirements. New Responsive Design techniques have played a role in the rollout of a new generation of mobile sites. So, where is the disconnect? Why the low conversation rates? One major aspect overlooked in mobile site design is search and navigation. Mobile keypads are clumsy, making it hard for shoppers to type searches. Small screen sizes and awkward touch screens make it difficult to use the complex navigation menus offered on most e-commerce sites. E-Commerce firms need to rethink the look, feel and functionality on their mobile commerce sites. Please take a look at our latest video which explains this problem and offers a solution to increasing your mobile commerce conversation rates, and leaping ahead of your e-commerce competitors. We announced this morning that EasyAsk and Magento have entered into a partnership, with EasyAsk being named a Magento Silver Technology Partner. Please read our press release for more details on the announcement. The partnership will enable the two companies to jointly market the EasyAsk e-commerce site search solution and engage with more Magento customers. In addition, it will more closely align technical resources to further integrate the EasyAsk solution into the Magento platform. The existing EasyAsk Connector for Magento seamlessly integrates EasyAsk search, navigation and merchandising services into the Magento platform and sites running on Magento. Please read our Magento product page to learn more about the value EasyAsk brings to Magento sites, and the integration of the EasyAsk Magento Connector. Please read more about EasyAsk in our listing on the Magento Partners Portal.